You know when you have your ipod on and you’re walking along to the beat and life seems great? Then you take out your headphones and realize how silent it is…and that maybe you were singing along a little loudly? This video takes that to a whole other level. 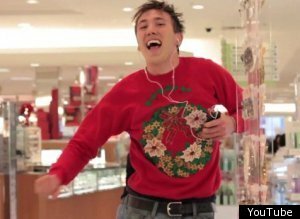 Nothing like dancing your heart out to Mariah’s All I Want For Christmas. In a mall. With an ipod. Click the picture to watch the video! A lady’s wreath sweater in elegant winter white. A lovely unisex poinsettia print sweatshirt. A candy cane sweater in a delicate shade of mint green, with candy cane accents. Remember last year when the Packers won the Superbowl? Yeah, it was epic! The Pack is doing well this year (perfect season so far) and it’s inspiring some amazing fan videos. This parody video is one of the best I’ve seen. Breakdancing, Packer lingerie, cheeseheads…what more could you ask for? Someone get me those gold pants stat! Fingers crossed we make it to the Superbowl again! I have two treats for you. Number 1, the best dog costume ever. Number 2, the greatest song ever written. It’s actually a really cool mash-up, and this girl’s voice is really good! This video is awesome. Close your eyes and listen- it’s a thunderstorm! Super Mario Like You’ve Never Seen Him Before! Dance competitions can be cool (sometimes) but add the Mario brothers to the mix and you get this epic performance. It brings the house down! It’s hump day. Which means the week is halfway over. Which might prompt you to break out into a little song and dance. Perhaps a la the gentlemen below? Do their colored jeans remind anyone else of old Gap commercials? Happy Friday ZTM readers! Sometimes you just gotta dance like nobody’s watching…even if everybody’s watching. And video taping. What’s more fun than the food pyramid? 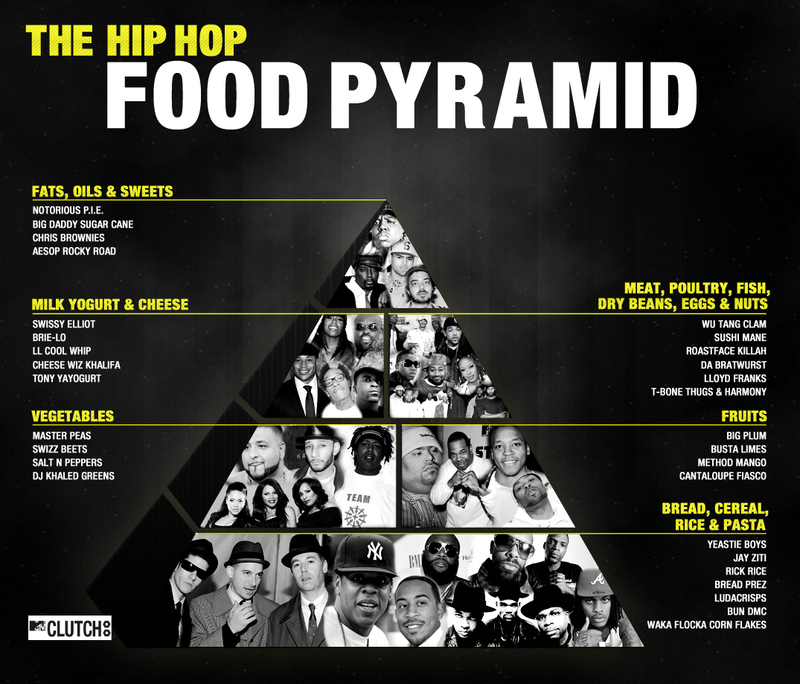 A hip hop food pyramid! Click here to see a larger version. Pretty clever. I think my favorite is Cantaloupe Fiasco!